In the middle of Cranborne Chase, a hilly and breezy open region in north Dorset, is the shell of a Norman church. Nothing special really. These churches are found in many villages and hamlets of Dorset. What is unusual is that it is built-in the middle of a Neolithic ritual henge (a ring of ridges dating from ancient days). The church sits alone…surrounded by earthen works built by Pagans. The building is a shell, built with stone and flint. It looks lonely. There is an aura of melancholy that pervades the site. If one sat on the henge, took the time to contemplate the view…I believe a sadness would fall upon you. According to my google search, the Knowlton Church is one of the ten most haunted places in Dorset. The visions that have been reported include a rider on a horse that charges through the grounds and vanishes as it enters the church. A weeping woman, sometimes described as a nun, has been seen. A face has been observed looking out of the upper window of the tower. A hooded man, tall and quiet has crossed the path of a visitor in recent years. The enigma? Why is there a Christian church built within the walls of a pagan ritual henge? Why is the church only an empty shell now? And, most interesting, is why is the village of Knowlton no longer in existence? History tells us that the town was hit hard by the Black Death…those who survived drifted to other regions. Remains of the homes are visible on the grounds to the west of the ruins. When Mariam and I stood on the ring earthen works, the wind blew with a force that nearly blew her glasses off. I was wearing my L.L.Bean coat and a chill cut through me like a razor. I wanted to stay and absorb the atmosphere , the solitude, the isolation and the loneliness, but Mariam and I could hardly stand upright in the wind. Was the wind telling us something? Were we on sacred ground? Haunted ground? Unforgiving ground? The melancholy began to take hold of me. But, as we drove away, I sensed something. I need to return to this place, this lonely place and spend some time…thinking, dreaming and imagining. I waited while Mariam took her shower and washed her hair. I felt like we were being delayed. We’re travelers, we don’t need showers. Tourists take showers. So, I snuggle deeper into the comforter and went to Spotify. She seemed to take forever to wash her hair and do whatever women do in the only bathroom in the suite, and a guy has to relieve himself. Once I secured Spotify ( not easy in any of the hotels we’ve been staying in), I decided to get her in the mood of the city and country we were touring. After five playings of Scotland The Brave and two readings of Coming Through The Rye, I think she got the point. She knew we were in Scotland. Our first job of the day was to visit a dart shop and buy my son a dart set. I won’t say more. It’s going to be a surprise. Especially when I give him the 23 gram Titanium shafts. Don’t tell him. We walked down Ely Street. The sandstone townhouses were beautiful. I next secured tickets to an American musical that just happens to be playing about 30 feet from our hotel door. We’re seeing Wicked. (For a fraction of what we’d pay in NYC). We decided to walk to the Edinburgh Castle. When we got to the Scott memorial, the police began to evacuate and tape off the whole area. I’ll buy The Scotsman tomorrow and find out what we almost became a part of. Someone told me that the tower gets a lot of jumpers. That’s very sad to hear that this beautiful and historical city has people who want to take a quick exit to oblivion. Which takes us to our post dinner activity. We booked a tour called Doomed, Dead and Buried. I couldn’t be more pleased. The tour guide was a beguiling young Scotswoman named Rachel. She wore a hooded cape. There was a brass clasp at her neck and she knew how to tell a story. If you want to hear those stories, you’ll have to come here and take the tour. I’m too exhausted to retell anything she said. This is a city that could grow on me. Dark history and a bright future. I was here about thirty-three years ago and I remember nothing of that trip, except that I was very cold on most evenings. Perhaps that’s why one can smell the coal smoke in the air (I’m assuming that coal is still used here, hopefully I’m wrong). As we left a pub after the Ghost Tour, I heard bagpipes in the distance. Someone was playing Scotland The Brave. I’m sitting on the sofa in our screened-in porch listening to the rain falling, heavily and with vigor, on our deck, roof and the new leaves of the maples. I want another mug of Dorset tea, but that would mean going into the kitchen one more time. I’m reluctant to do that. There is something going on in the kitchen that causes me to suffer the most prolonged insomnia and induces the more horrific nightmares when sleep does finally come to my weary and reddened eyes. I’ve always wanted to own an indoor/outdoor thermometer. I wanted one even as a young child. While the other boys in my neighborhood would be playing catch or stealing apples from the old orchard or riding their bikes around the block singing: “Back in the Saddle Again”, I would be dreaming of owning a device that would let me know what the temperature was both inside my home and outside in the yard. 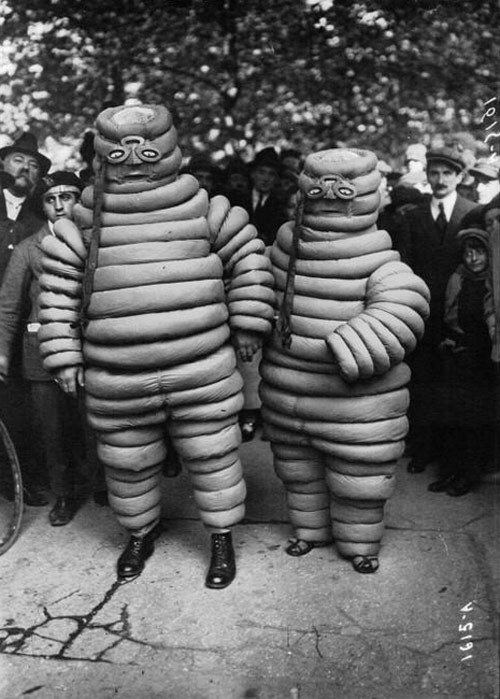 The only problem was that these instruments weren’t yet invented. If I wanted to know how cold it was, I would have to don a coat and flannel-lined jeans and trudge out to the wall of the garage and look up at the mercury column, inside a glass tube that was attached to a Coca Cola advertisement. Now, sixty years later, I own three of these wonderful little units. There’s one in my “man-cave” in the lower level of our house. There’s one still in the box, just as it was when I bought it at a Costco’s in Jupiter, Florida. And, there is the one in the kitchen…on the narrow sill just above the sink. It’s small. It’s accurate. And, it simply terrifies me. I’ve written two posts on this Radio Shack model before (or maybe one blog and a Facebook post, I can’t remember). So, for those who have been following me over the years, you may know what’s coming next in this particular report. For those of you who are more recent “followers” of my stuff here on WordPress, then be afraid, be very afraid. Do not let your children read this post. If you’re weak of heart or a faithful church-goer, you may want to stop here. You see, my friends, my wife and I bought this house in 2000. We used it as a vacation home for a number of years, renting it out to people willing to come to the Adirondacks and get bitten by black flies and deer flies and mosquitoes while enjoying the hiking, boating and swimming that the Park offers. We were living on the Upper West Side of Manhattan at the time. It was the perfect weekend get-a-way retreat for us when we felt the need to escape the artistic and cultural life of a vibrant city. It was only a mere six and a half hour drive (305 miles) from our front door on W. 93rd St. to the driveway at 58 Garondah Road. 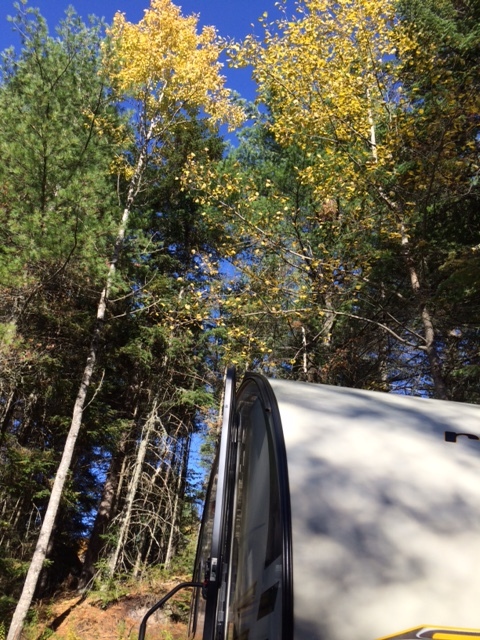 Within a month or two of buying the house, I happened to be in the Saranac Lake Radio Shack. I was looking over the radios and kits of all sorts when I spotted it. There it was. An indoor/outdoor thermometer! Naturally, I bought it and within an hour I had it up and running. I carefully placed the outdoor sensor outside our kitchen window and behind a shutter…in the shade. It was this very same thermometer that I glanced at one evening while we making a quick winter trip to use our new L.L.Bean snowshoes, and saw that it was -36 degrees. This was probably the first time that I began to question why we had chosen to live this far north. I put in two AA batteries. It was 2000. At first, for a year or two, everything went smoothly. Then, I began to notice something strange…something sinister…something that has grown more terrifying as year came and went. I knew this was especially true of batteries. Why else would places like Best Buy, Wal-Mart and Radio Shack sell them in packages of sixty? 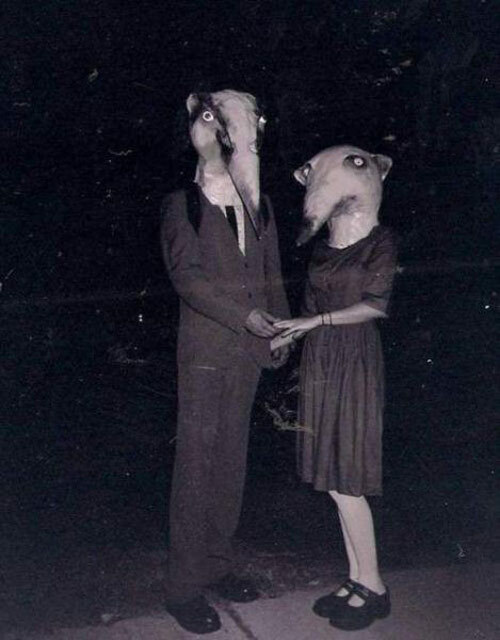 And, this, dear reader is where the story becomes unnatural…eerie…and downright frightening. It’s been sixteen years since I put in those two AA batteries…and they are still working! It’s not my imagination. I will swear to the good Lord above that I have not replaced those two batteries. I want desperately to open the back of the indoor/outdoor thermometer and check on the brand, but I am afraid to open the small plastic door. I’ve seen enough Steven Spielberg movies to know that when you open certain items, unholy things come, like smoke from a clay Churchwarden pipe and the demons of the Other World are released. I have enough guilt in my heart already…I don’t need to unleash Satan or whatever into this world. It’s already too violent, religiously insane and terrorizing…and I’m not just talking about Donald Trump here. But, something is powering my indoor/outdoor thermometer. Something sinister and unworldly. It certainly can’t be the AA batteries…sixteen years is fifteen and a half years beyond their expected lifetime. I still want a second mug of Dorset tea. I think I’ll ask Mariam to go into the kitchen to make it for me. I can claim my back hurts. And, it does. I have an MRI to prove it. Was it a day in full blinding sun or a night in deep gloomy shadows? Was I asleep? Awake? I don’t remember. No, it was both. I wandered about in my dream with my eyes open, my dream that quickly became a nightmare. What I looked upon were reflections of my darkest thoughts and fears. 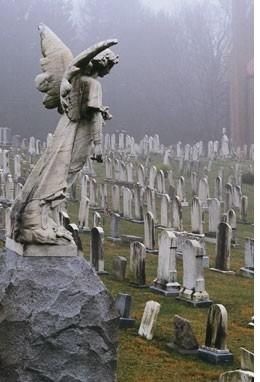 My sub-conscience was trapped in the dreaded landscape of the land of the dead–the churchyard, the cemetery, God’s Little Acre, the lawns and fields of the departed. The angel stood on the rock and watched over the mute stones. I stood watching a man mourn the loss of his wife, lover, child, parent or self. He cannot bear the loneliness of existence. He pulls at the door. It is solid and firm in its closure. The door is thick bronze. I touch his shoulder to offer solace. He, too, is bronze. It’s all metal and stone except for the dust that lies within. He will remain in this torment until the acids of the rain reduce him to molecules. I walk on. I don’t know why I do this. I know what awaits me behind the next tree or over the next hill. I walk into the trees. 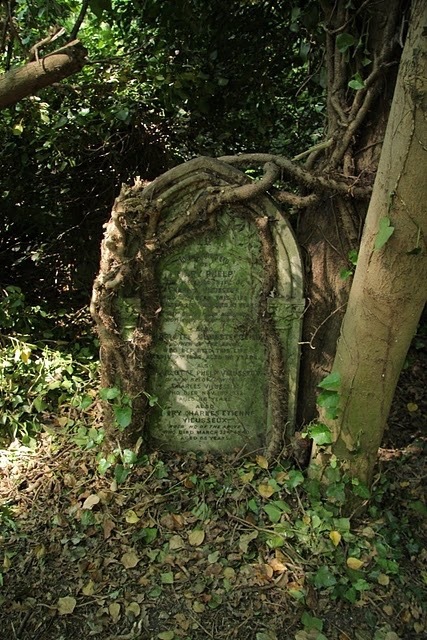 Roots have begun to ensnare a gravestone. The trees will absorb the crystals in another century. Then, who will remember? Where will the flowers be placed? Where will the tears be spilled? The only comfort for my eyes are the green and living leaves, mosses and lichens. Objects with life hold firmly to the ultimate symbol of death. 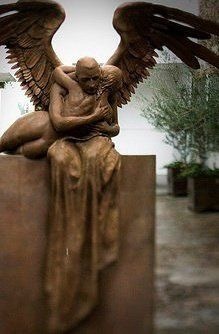 Somewhere in Mexico–when you were hurting and in despair, I sent my angel to comfort you. You are not alone. I will be with you even unto the end of the earth. There is an old house with an open door. I grew up and passed from childhood into manhood in an old house. I must enter. I walk into the foyer and along the hallway. There she is. The transparent image of a long-ago lover. Or is she the sister I never had? Or is she my mother as a beautiful youth? Or is she someone unknown to me–coming to hold my wrinkled hand and place her young cold lips on my warm cheek. 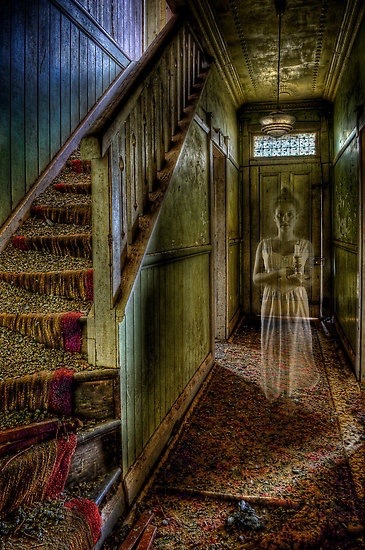 Instead, she passes through me and ascends the stairs to meet another shade–someone her own age to play with–someone as spectral as she. I watch her ascend the stairs and experience an overwhelming sense of melancholy. I wished to know her in life. I probably would have given her my heart–the heart she would break when she passed away. My heart breaks as easily as ancient Oriental porcelain. I leave the house to her spirit. I whisper a prayer for her restless soul. Does anyone hear my words? I walk on into a monochromatic world. 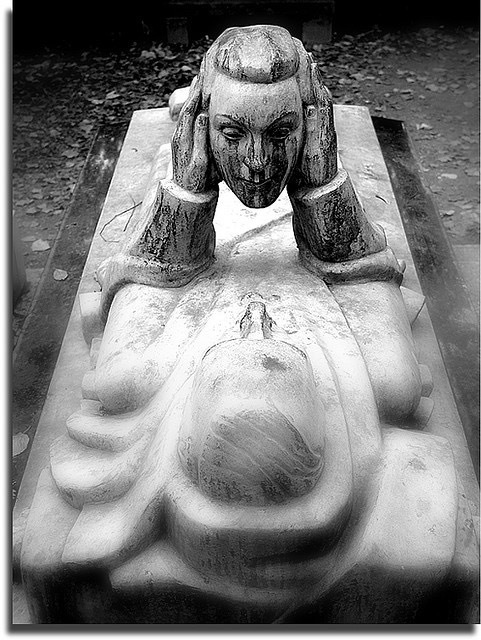 There at my feet is the grave of a man who is holding…is it his own face? The head of someone he is longing for? The visage of a family member? I walk by and he continues to stare, without terror or anger into another pair of eyes. I have seen too much for a living and mortal mind to comprehend. I want to be awake. I don’t care if it’s just past mid-night or if the sky in the east is becoming pale. Pale! Enough pale! I want to be amongst the living and the breathing. I want to mingle with lovers who embrace with a terrible passion for life. I want to walk along flowered paths rich with bees and insects and birds singing for the company of a mate. I want to help a lame farmer till his field, an old woman with arthritic joints knead her bread, a teacher tell his students the truth about life, calm a couples angry words, write a song a child will love, write a book that will make a man weep, kiss a wanton woman, drink a dark ruby wine, eat a mushroom in a desert, draw a picture that a blind person could see, dig a grave, speak words at a burial, pour Holy Water on an infant’s forehead, stand on a mountain peak so very sharp and pointed that the highest crystal pierces my thick boot soles and makes my foot bleed so that red stains on the heather will guide a lost soul to the low meadows. I can feel sleep falling away. But, I sit up in bed, still in a deep slumber and see my last vision for the night. 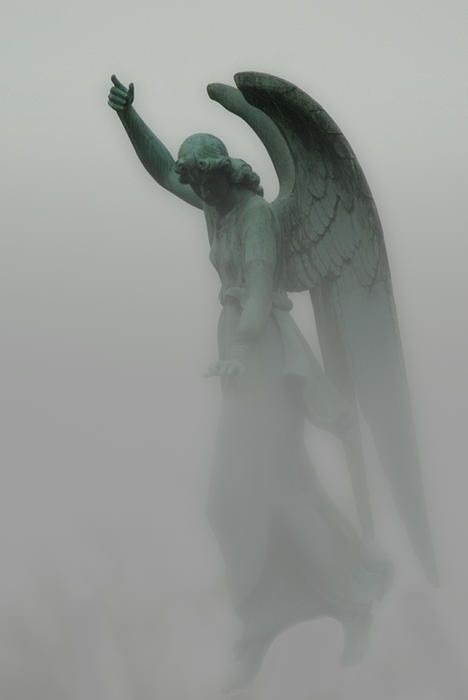 It’s the Angel of the Fog. But is she fading away or growing more real? What will tonight bring me as I put my book down and let the dark envelop me? Midnight in the Laundry Room. I’m writing this in a laundry room. Four washing machines are on my right and four dryers to my left. I’m here because the promised WiFi signal is very weak in the R-pod. Here the signal really smokes. Yes, it’s midnight in the laundry room, a spooky place where a sock can vanish before your eyes. The fluorescent lights bring out all the blemishes of the white formica table top. Above my head is a full moon. I can’t see it because the remnants of a major storm passed through Georgia today. The sky was left overcast, but, the weather is slowly moving eastward, out to the Great Atlantic Ocean. If I step outside right now, I may see a brightness that reveals the moon’s location. 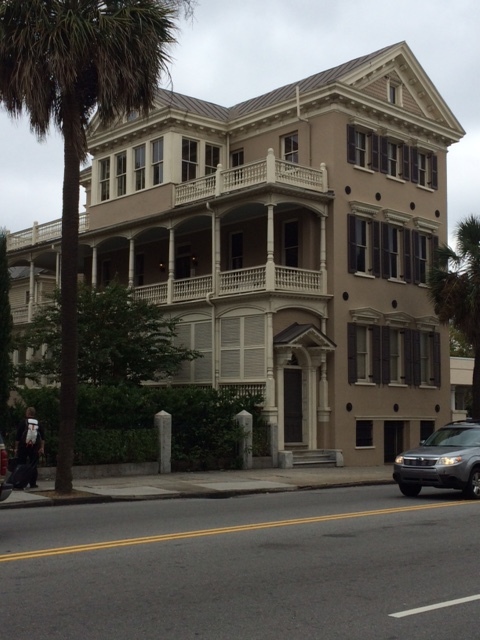 This post is about Charleston but I’m not even in that city anymore. The day before yesterday (its past midnight now) is when we stayed just outside Charleston, SC. Today, we’re in Brunswick, home to the fabled Golden Islands. But, let’s go back to Monday. It seems like I’m a day or two behind in my posts. So, if your curious about Brunswick, wait a day or so. For two tired travelers, we packed quite a lot into a single day in that most interesting and beautiful city. We spent the daylight hours seeing the sights that all the tourists come here to see. However, this city has two separate personalities. There are the magnificent homes, with the flowered gardens, ivy and palm trees. At night, there is the melancholic Spanish moss, greenish-gray and drooping from the Live Oaks. We strolled under the overcast sky during the day and we spent the evening, the dark time, lurking around haunted buildings and spine-chilling churchyards. You will have to pony up $20.00 a person for one of the four or five Ghost Tours. The main thoroughfare through town is Meeting Street. It’s a restaurant-lined avenue that acts like a reference to walkers and shoppers and diners. We decided to take it easy on ourselves and take a 90 minute Grey Line tour. My neck is sore from trying to see the tops of the houses. I felt like Linda Blair trying to keep up with what the driver/guide was telling us. (He’s a former teacher, so that explains a lot.) The buildings are some of the most beautiful and interesting I’ve ever seen. Pastel colors are common choices. The heat and humidity of the summer days forced the designers to come up with inventive ways to maximize the sea breezes. The great porches wrap 3/4 of the way around a building. The porches are large enough to earn the title ‘piazza’ style. That’s where you would find me, if were a wealthy planter, sitting in a wicker chair and sipping a mint julep on lazy afternoons. I walked the streets. I turned corners and peaked into secret gardens. I stopped to smell the flowers. I rested on park benches and bought post cards. And, I looked down at just the right time to notice something interesting. We’re outside a locksmith shop. 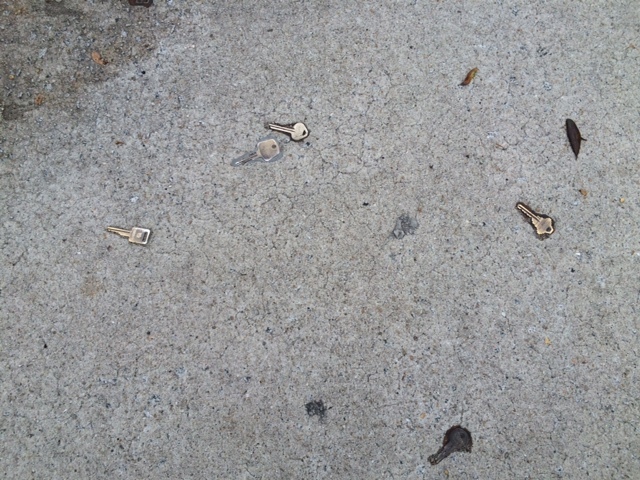 The owner, in a raging fit of creativity, had placed dozens of keys in the wet cement when the sidewalk was being poured. An easy to miss, but interesting approach to advertising. 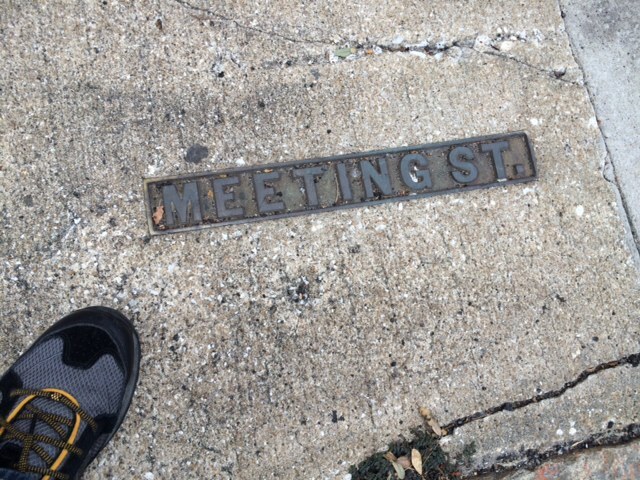 We continued our stroll along Meeting Street, or was it King Street? As we approached a fire station, I was amused by the statue of the Dalmatian that appeared to be sleeping on the sidewalk. I hesitated. I was curious if they had one of those brass poles that you see the fireman slide down (in the cartoons and movies). I went in and asked a fireman if they had one. This led to a tour of what he said was the oldest continuously operating fire house in the U.S. 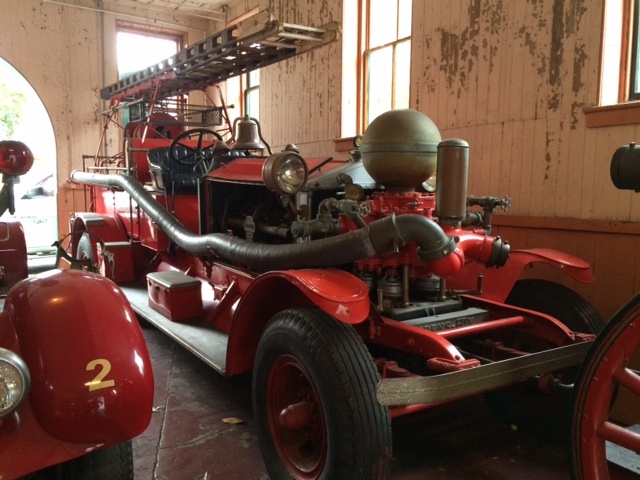 He took us up to a building in the rear and there were three antique fire engines. One was of special interest. The story goes that the company that made those particular trucks was once on the verge of bankruptcy. Along comes The Three Stooges. They filmed a skit on one of those trucks that was very similar to the one we were looking upon. 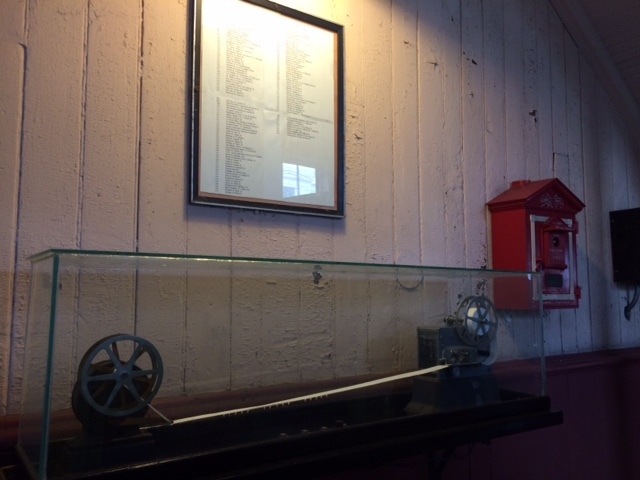 After the film came out, the company was besieged by fire companies all across America. They couldn’t make them fast enough. He also showed us a very interesting display in one of the side rooms. There, on the wall, was a typical red ‘fire-box’ that would be found along any city street. He flipped the switch to demonstrate. The signal would come into the fire station and trigger a teletype machine which would punch out a code. The code was then referenced to a chart which gave the street where the fire was burning happily away. The daylight was fading. We had dinner in the one restaurant that had the widest reputation. 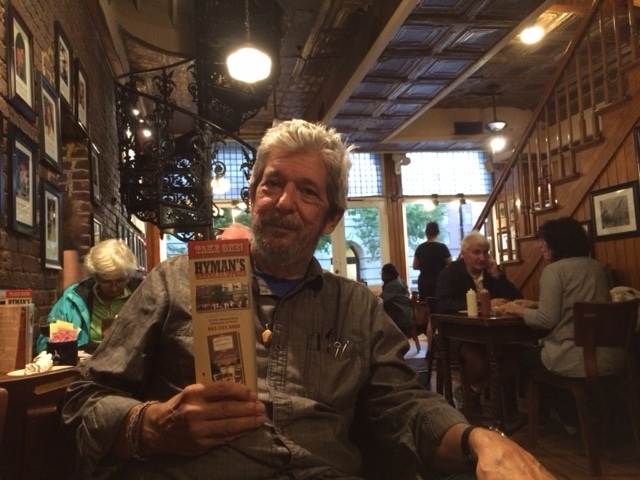 My friend, the poet, Dara Reidyr, who grew up in South Carolina, said we simply must have dinner at Hyman’s–and be sure to include grits and hushpuppies. This we did. It was a four-star establishment in my book. Thanks, Dara! And, now for something completely different. Night has fallen on the city. 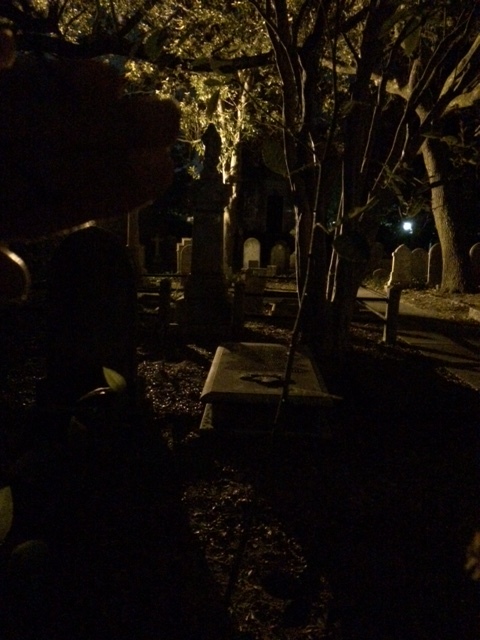 We had booked a “Ghosts of Charleston” tour at 7:30 pm. We met our guide by a circular fountain at Waterfront Park alongside the Cooper River. Off we went to see the places that the TV “Ghost Busters” crew had claimed were “really hot” in terms of paranormal activity. Our first stop is outside the Southend Brewery & Smokehouse on the corner of East Bay and Queen Streets. Back in the day, the day of King Cotton and Indigo plantations, it was a three story cotton mill. The rough work with the freshly picked white fluffy stuff was the first floor. The finishing work was on the second floor. One more flight up was a gentleman’s club where a planter or merchant could enjoy a whiskey and a cigar and talk the talk of men who made their fortunes from the labors of West African slaves. Real gentleman, these. One planter was celebrating a recent transaction of ‘selling’ his cotton to the merchant. The goods were aboard a ship that had just set sail for England, where the quality of the South Carolina cotton was highly prized. As this guy (forgot his name) gazed out of the window overlooking the harbor, he saw what he believed was the ship carrying his precious cargo, catch fire and then explode. He stared in mute horror. He was now a broken man, financially and otherwise. He downed a few more fingers of whiskey before he realized he couldn’t go home and admit to his wife that all had been lost in the ship’s fire. So, he did what every broken-spirited man with no future had done from time immemorial. 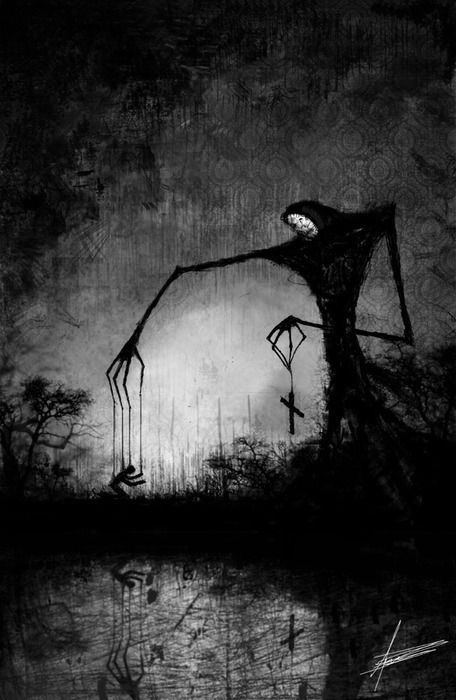 He fashioned a noose of twine and stepped off a chair into eternity. The twine, of course, acted like razor wire and he essentially bled to death…his life’s blood dripping down three floors. Clearly that wasn’t the end of the story. You see, he still wanders the building to this day. Was there anything good that came out of this tragedy? Well, his widow got a very large check from the sale of the cotton and went from mourning black to bridal white in a very short time. You may reasonably ask why she got the money. Here’s the punch line to this sad tale: The poor fellow had witnessed the wrong ship explode. By the time he finished the last whiskey of his life, his cargo was already out of the harbor having departed on the outgoing tide. 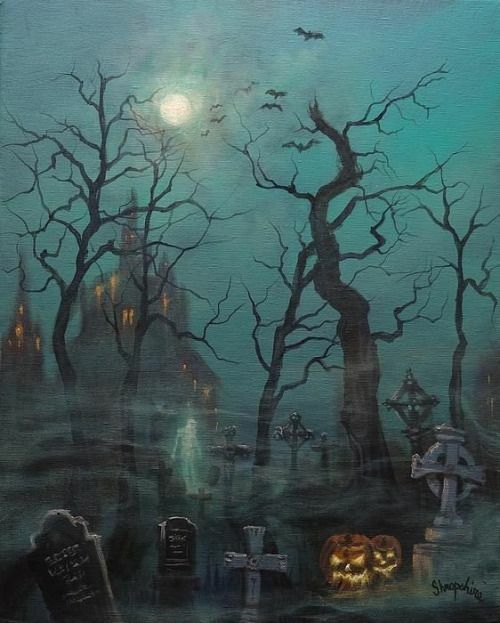 Here is a dark and rather spooky cemetery. 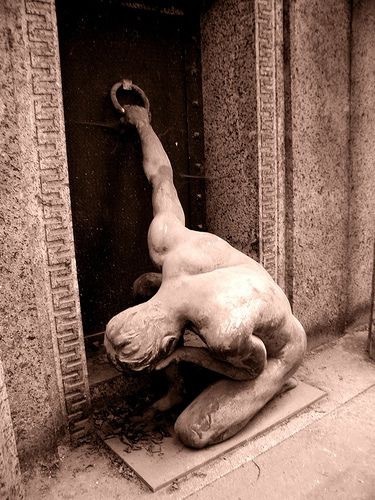 Often, a kneeling woman is seen at the grave of her daughter who had died of a childhood disease in the 19th century. I saw nothing. Do you? 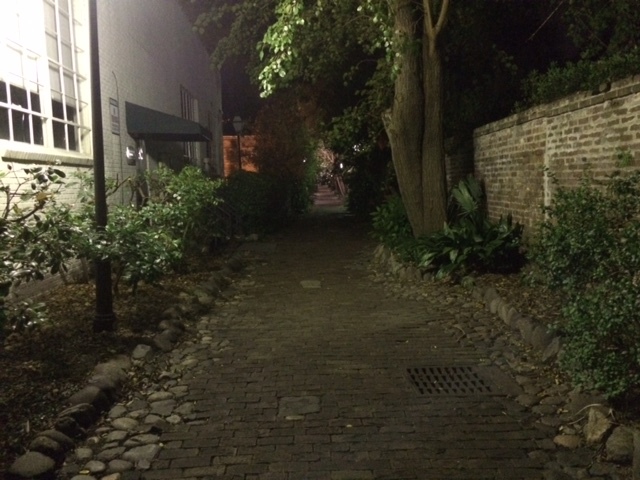 A short distance away was the infamous “Dueling Alley”. I can’t go into the fifteen stories of duels that took place there. I’ll only mention that a prominent physician was killed in this alley sometime in the 19th century. He used to walk the path and whistle on his way to work. People have reported hearing the whistle and seeing a man in period clothes stroll the walkway. Again, I saw nothing. It’s a long distance from the alley to this laundry room. The alley was dark and forbidding. The laundry room is blinding bright and a persistent noise is coming from behind the washers. I can say one thing–it’s not a whistle.